Featured in the Vogue Magazine. Kale, that weird leafy green everyone used as a garnish before they realized it was a super food.. heard of it? Well, kale has a ton of health benefits, so if you’re only lining your plates with it or putting it in your green juice, you’re totally missing out on it’s topical skin benefits! Kale is packed with beneficial vitamins and nutrients that are good for you both inside and out. It’s abundant in vitamin A, C and K, making it a triple threat against aging. Vitamin A stimulates healthy skin cell production, and when paired with a regular exfoliation such as microdermabrasion, can be an incredibly efficient way to keep your skin firm and healthy looking. Vitamin C is one tool that fixes many problems. Vitamin C does everything from stimulate collagen to treat and even prevent ultra violet induced photo aging. Vitamin C is the ultimate tool in brightening and evening out your skin tone and giving you that healthy glow. Vitamin K helps everything from bruises to stretch marks and scarring and is a great treatment for acne scarring! Vitamin K helps to speed up healing and reduce swelling while Vitamin C swoops in to help lighten those scars once they’ve healed! Vitamin K also works to lighten dark circles under the eyes as well as tighten the skin. Kale is also packed with antioxidants that prevents skin damage from free radicals. 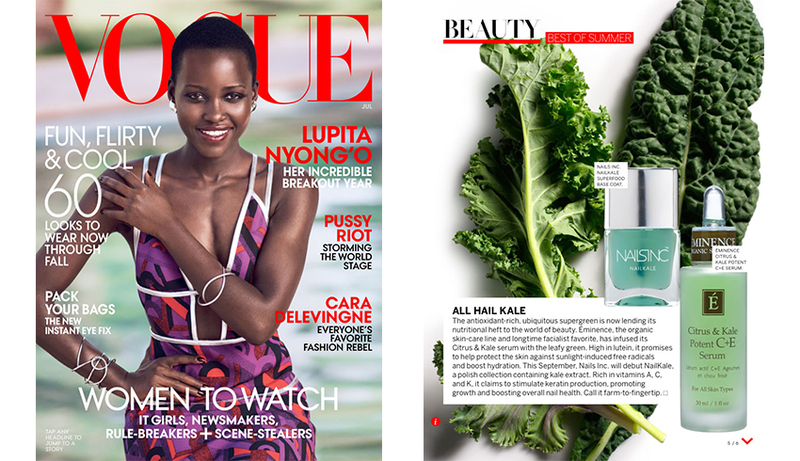 The Citrus & Kale Potent C + E Serum by Éminence is full of this magical leafy green. Don’t believe us? Take some from the dropper and put it in the palm of your hand. It’s naturally green! It heals and protects the skin and it’s completely organic! The serum is naturally fortified, meaning all of the nutrients that skin love, occur in it naturally. All Éminence products are free of harsh chemicals and perfect for sensitive skin. And it starts working immediately. After just one application of the Citrus & Kale Potent C + E Serum you will notices a softer feeling and looking complexion. So go green!